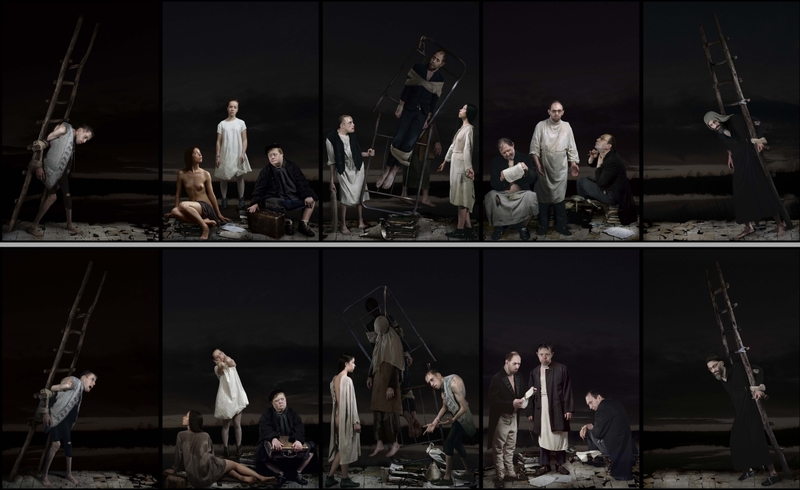 Just as they did for The Last Supper, the work which meant Raoef Mamedov’s international breakthrough at the prestigious international contemporary and modern art fair ArtBasel in 1999, Mamedov’s experiences as a nurse in a psychiatric hospital in Russia formed the immediate cause and the concrete background for this double quintych from 2016. The deplorable, desperate conditions of the patients and the cynical and fatalistic attitude of doctors and nurses form his first clear source of inspiration. In his story The Soldier, Mamedov tells us of a completely bewildered and deranged soldier who has to be permanently constrained strapped to a metal hospital bed and who eventually dies at the hands of the equally desperate hospital staff. The story is an allegory for La Condition Humaine, and the existential primal fears and urges for power and submission that go along with this Human Condition. With his dark and piercing imagery Raoef Mamedov refers to both a Judeo-Christian iconography as well as to the northern expressionism of Edvard Munch. Jacob’s Ladder, dating back to the Old Testament, should provide an escape from our human tragedies and open up the possibility of reaching paradise, but instead coincides with the cross Christ is strapped to; Christ who should lead us to salvation from suffering, while Judas’s suicide is inseparably connected to Christ’s death. In the wounded chained figures at both ends of the double series we recognise the soldier from Mamedov’s story; their eccentric placement in the quintych refers to Dismas and Gestas, the ‘good’ and ‘bad’ murderers that supposedly flanked Christ on mount Golgotha. In the darkness that forms the backdrop of the scene, Time loses all meaning. At the same time we are confronted with the three life phases of woman, the same stages Munch so explicitly depicted in his work Woman in three stages (1894). The vulnerable purity and innocence of the young girl, who in Mamedov’s work is still receptive to Dismas’ cry, stands next to the alluring adult woman, who has understood that silence protects her fatigue, while the old woman realises all she has left to cling onto life with is her suitcase. Insight into the degeneration of human existence and the reversal of things in people’s perceptions, which blurs the meaning of the concept truth, are depicted by Mamedov again in the fourth and fifth panels of the quintych. The three men have swapped clothes and attributes, making the doctor no longer the doctor, the nurse no longer the nurse and the patient no longer the patient. With this, the artist draws a parallel with the work of philosopher Friedrich Nietzsche, who proposed a perspectivist epistemology. Nietzsche argues there is no absolute, objective truth. The perspective is temporarily true for the person who designed the perspective. In this sense, the glasses worn by some of the depicted characters also refer to the great German philosopher, who went practically blind at the end of his life, but also made a significant left-turn in his way of thinking at that point. Mamedov appeals to the archetypical experience of the observer. And like the other doctor in The Soldier, who could calm his patients and get them to reflect on themselves by showing them their own image, Mamedov’s work once again makes us look at ourselves in the mirror.